Flowers March-May. The most conspicuous golden flower of early spring on damp meadows. Very large flat leaves. It is found on sites with less than 10 weeks dry soil per year and 10-20 weeks wet soil per year. 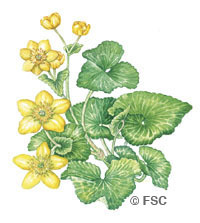 Alternative names are kingcup, molly blobs or in Shakespeare “Marygold.” The sap is irritating to the skin. ‘Palustris’ means ‘of the swamp’. It is an ancient plant that is thought to have survived the ice age and flourished after the retreat of the glaciers.